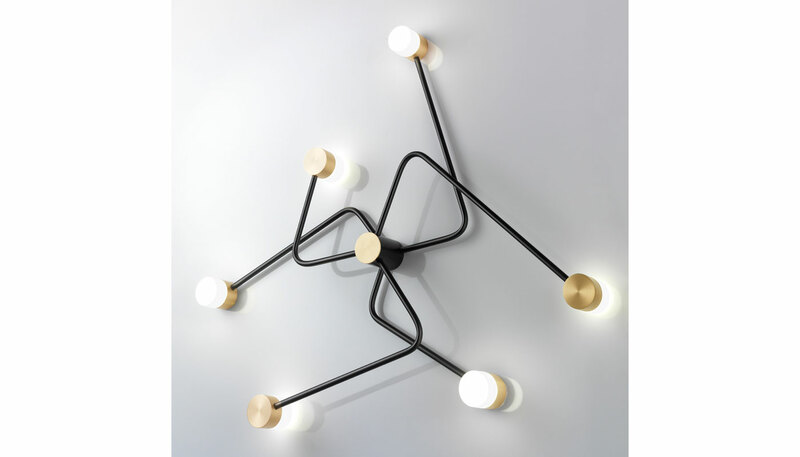 The Constellation light instantly conjures the rhythmic exuberance of midcentury metal wall sculptures. Constellation is a modular wall sconce that features six asymmetrical solid brass “arms” that emanate from a central “hub” and culminate in integrated diffusers composed of opal mouth-blown glass. Three of these face outward; three are oriented inward diffusing light against the wall. The Constellation wall light can be used singly as a sculptural sconce or combined where the sconces can be overlapped and oriented in different directions to create dramatic and personalized wall or ceiling installations. Constellation is available in several finishes. Manufactured by CVL Luminaires Contract / CVL Lighting. Read more about several CVL wall lights in our blog by clicking here.